Two special friends of mine (Kay and Jo) have made me this gorgeous Jolly Chunky Bag with Scheepjeswol Stonewashed XL. 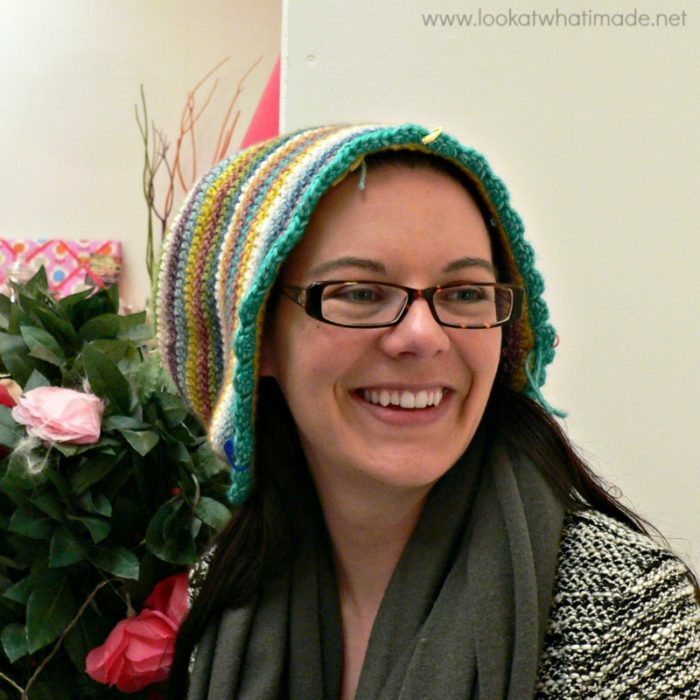 The pattern is available for free HERE on Attic24. It is simply gorgeous and gorgeously simple! The lining was chosen on my very first visit to the new Fabric Warehouse (in Uxbridge, London), right after I had first started making Sophie in the Stonewashed XL. 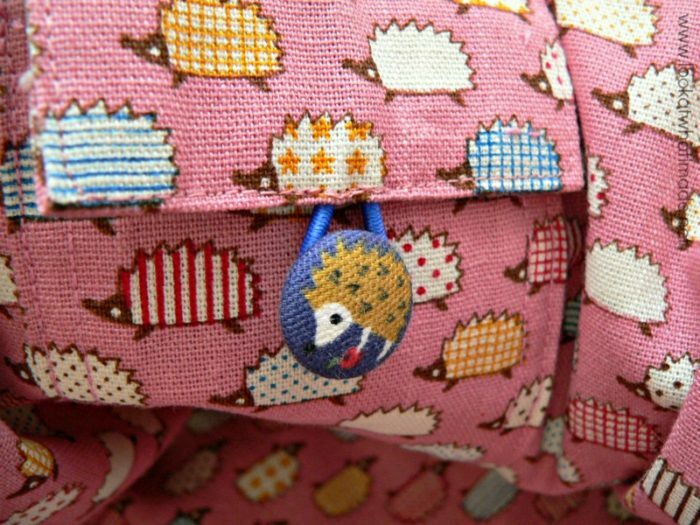 At first glance we thought the animals on the fabric were little scheep, making them perfect for the Scheepjes (Sheep) bag. On closer inspection we realized that they were hedgehogs and Jo promptly dubbed them “Scheepjeshogs”. I cannot begin to tell you how many special memories and nostalgic “nonsenses” are intertwined in this bag. 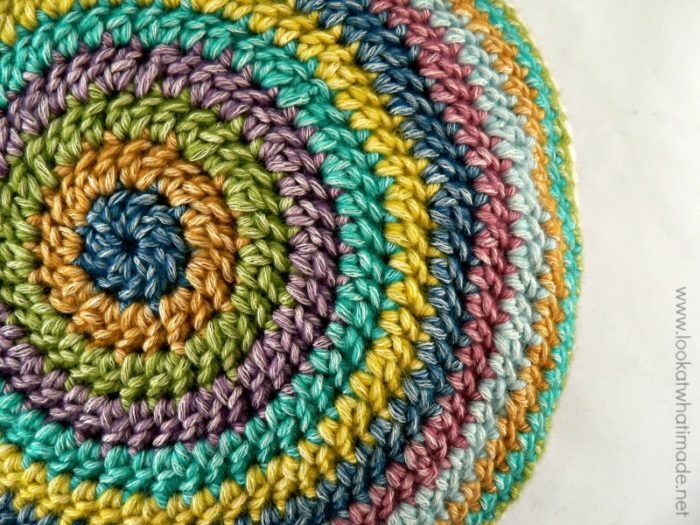 It represents all of my Sophie journey, as well as 4 wonderful crochet friends: Jenny, Lynnette, Kay, and Jo. Back to my beautiful bag! ..and Jo added the lining. 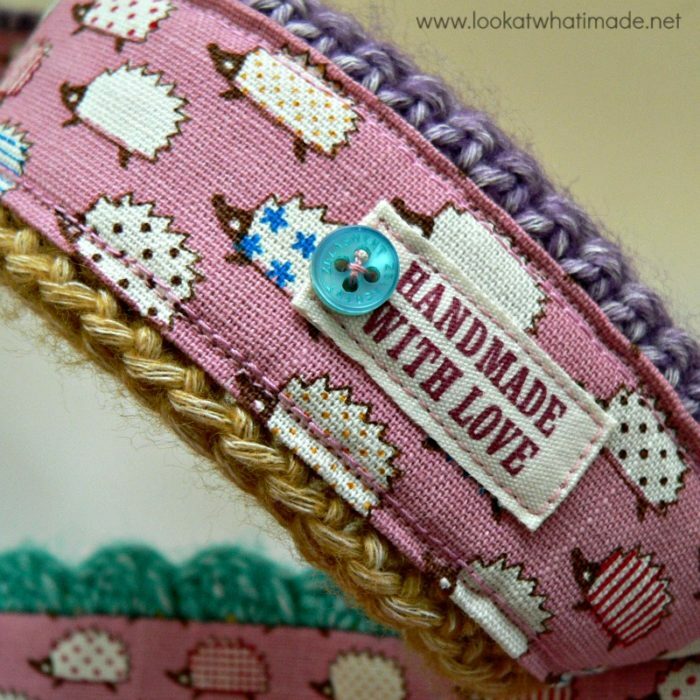 …and this “Handmade With Love” label. If you look at the photo above, you will see that Jo actually stitched the lining to the handles instead of hand-sewing it like the rest of the bag. She says that she learnt by trial and error. And the stitches are hardly visible on the outside of the handles. In fact, most of them aren’t visible at all. My first glimpse of the bag-in-progress was when Kay came to help me with Part 13 of Sophie’s Universe. I was amazed at how much more vibrant the Stonewashed colours looked on the bag. In my large Sophie the colours are deceptively muted. …and I got to fool around with the bag. 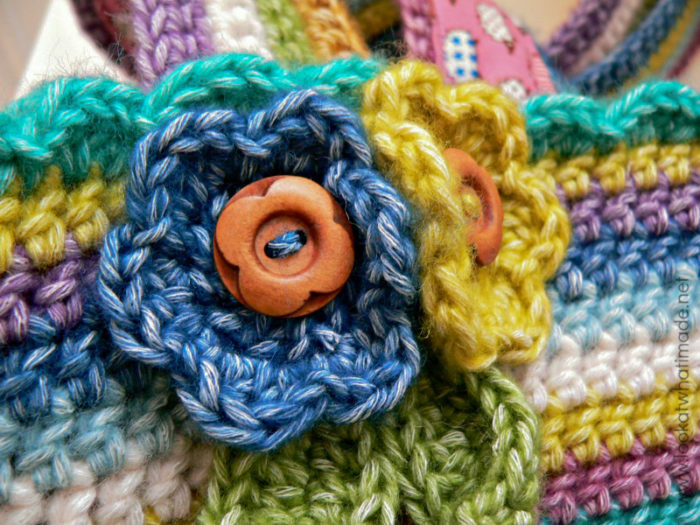 Kay used a 5 mm Clover Amour Crochet Hook (US 8/H UK 6). 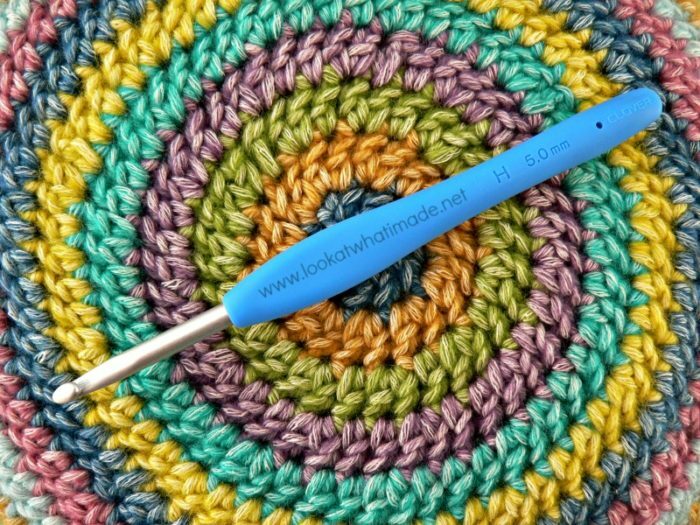 You can find the whole set of Clover Amour Crochet Hooks HERE on Amazon (currently $43 – discounted from $72). I chose Scheepjeswol Stonewashed XL (available HERE from Deramores) in the following 9 colours: Moonstone, Deep Amethyst, Corundum Ruby, Lemon Quartz, Canada Jade, Blue Apatite, Green Agate, Amazonite, and Yellow Jasper. Deramores ships worldwide above a certain amount, by the way. 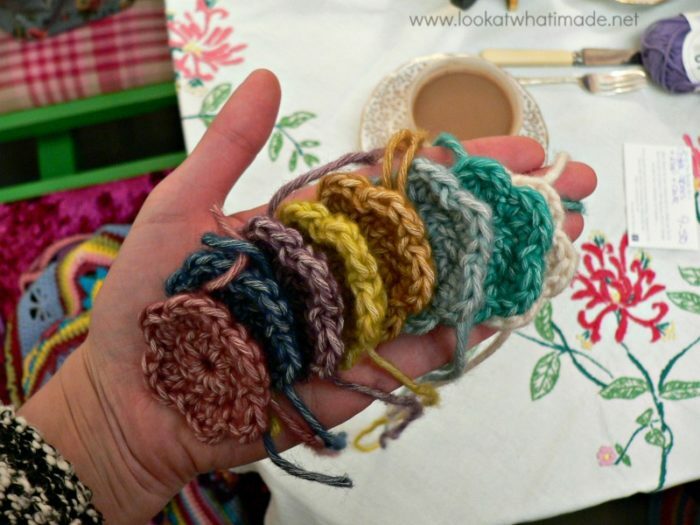 Kay used approximately 35 g of each colour, so I have a little bit left over to play with. The first 3 adaptations were personal choice. Standing dc at the start of each round. Invisible join at the end of each round. 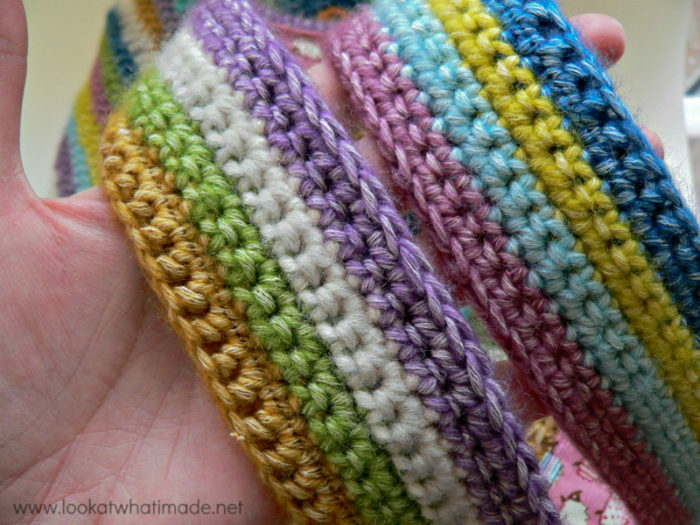 Straps: 110 foundation sc’s plus 7 rows of single crochet. Blue Apatite and Yellow Jasper (foundation rows) – 10 g each. Lemon Quartz and Canada Jade – 8 g each. Amazonite and Moonstone – 8 g each. Corundum Ruby and Deep Amethyst – 8 g each. One in each colour except Canada Jade – 3 g each. 8 in Canada Jade – 10 g for 8 leaves. 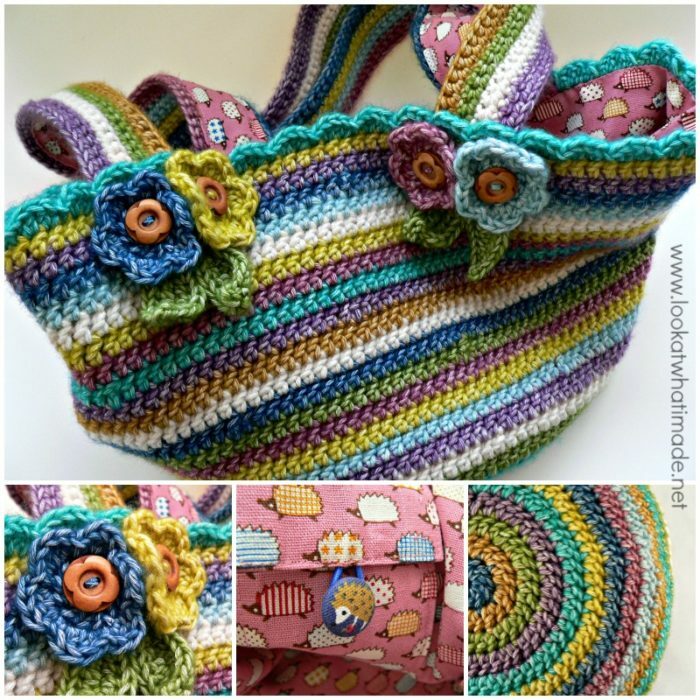 I absolutely LOVE my bag and I would like to say thank you to Lucy for this simple pattern. Also a massive thank you to Kay and Jo for making me feel special beyond words with their generous gift. 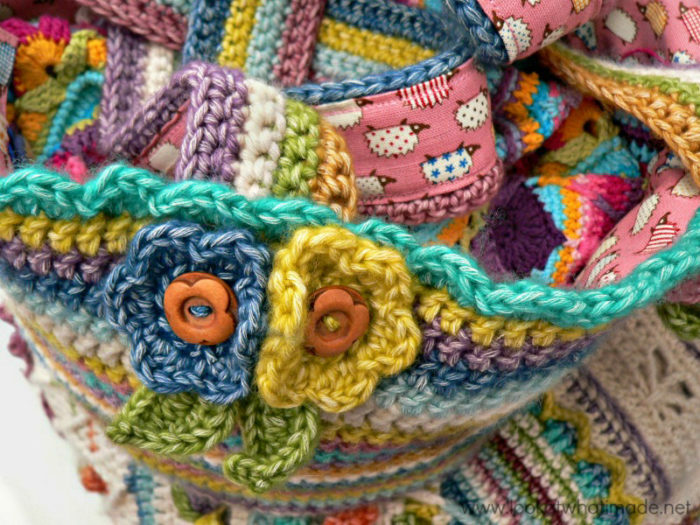 My Jolly Chunky Crochet Bag is just big enough to fit my small Sophie in (up to Part 18 in the photo below). I am almost too scared to use it in case it gets grubby. I say “almost”, because there is no way in the world that I would NOT use it. 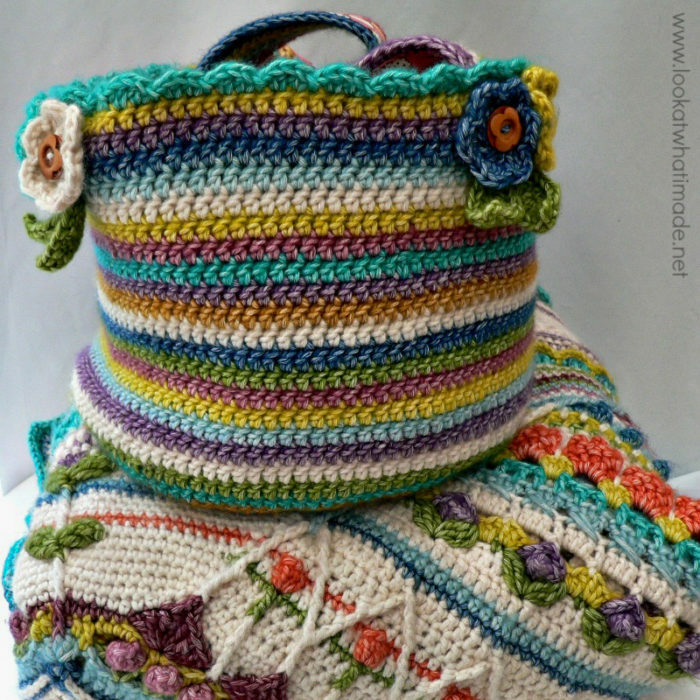 Love the bag in Scheepjeswol! What a gorgeous bag. Thank you for sharing. Just curious is there any stiffening in the bottom or sides? 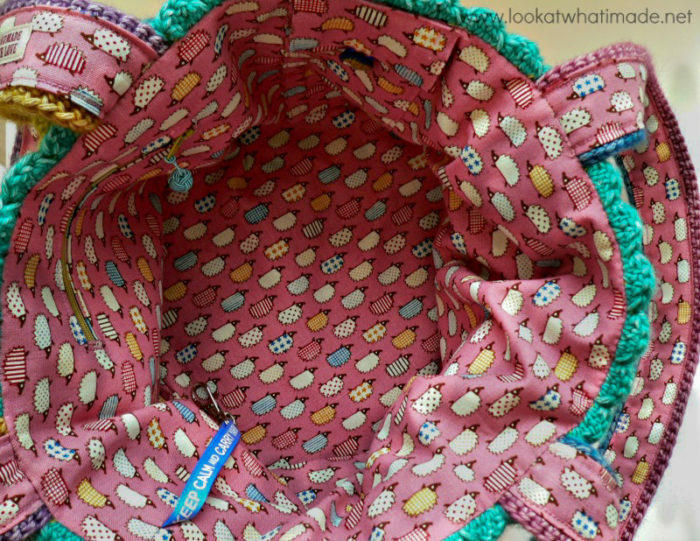 Had the idea of doing a smaller one with hook sized pockets all round for all my hooking tools. I have had this pattern since you first put it “out there” Such talent you have and such a wonderful heart being so willing to share all of it. I certainly appreciate you. I love this bag! And the Stone Washed yarn. Thank you for the pictures and the pattern. As soon as I’m done with Sophie, this will be my sister’s birthday gift. Thank you, Kathleen. 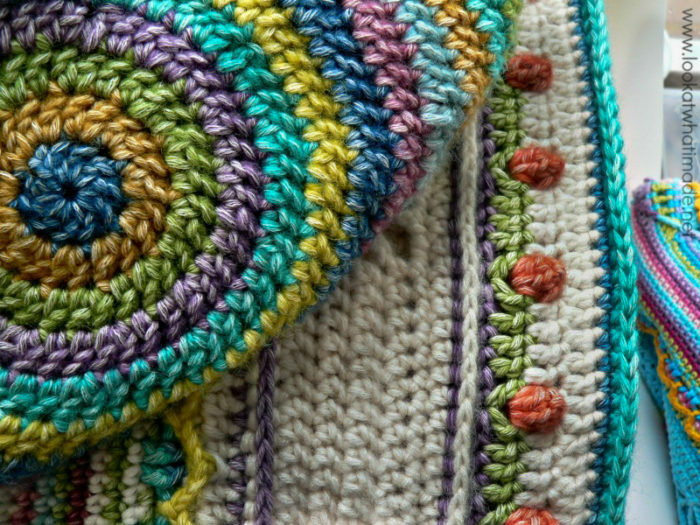 Attic 24’s patterns are always so simple and delightful. I think it takes a lot of skill to design less that looks like more, if that makes sense. 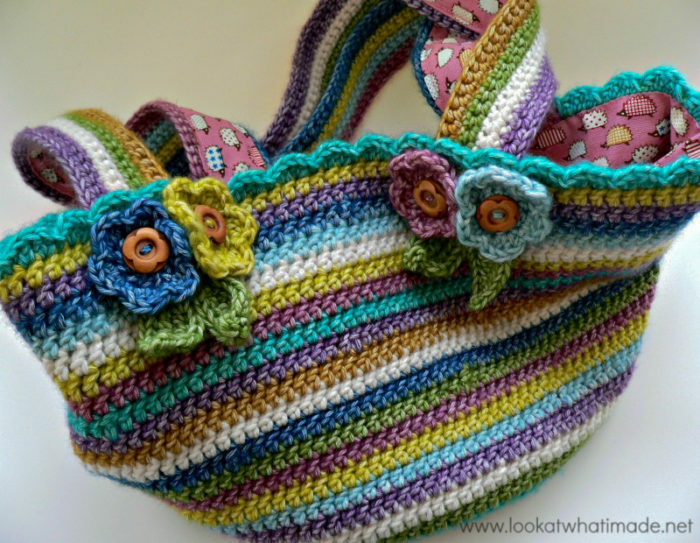 Love love love this gorgeous bag, made with love & so much fun – happy sheephogs memories with special friends! I like the idea of lining the bag, I just finished mine. I have to sew on the flowers, but I think I will line it first. Where did you get the cute buttons? They really set it off. Debi, do you mean the flower buttons or the hedgehog button?